W.H. 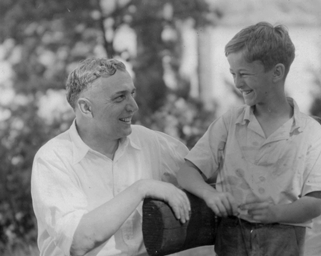 “Daddy” Wones is credited with laying the foundation for Camp Manito-wish YMCA. As Boys Work Secretary for the State of Wisconsin YMCA, Wones was the first to recognize the potential of a northwoods camp. He scouted the area, located the eventual site and was instrumental in giving the camp its name. Wones opened the camp in the summer of 1919, the first of the 19 years he would serve as camp director. Wones was an ideal role model for the campers in his care. He never cursed — “Oh joy!” was his constant exclamation in happy, sad or trying times. He encouraged both physical and spiritual growth, and was a great believer in service to others. Wones embodied the spirit of Manito-wish that we carry with us today. Wones was a great advocate for Camp Manito-wish and his efforts helped achieve many expansions and improvements. He was instrumental in South Bay property being added to camp, the building of Nash Lodge and establishing the Chapel in the Pines that now bears his name. It was Wones who established the phrase “Here let the fires of friendship burn” over the fireplace in the Connor Council Ring, located in Nash Lodge. Camp Manito-wish was the culmination of his life’s work, a place he lovingly crafted with his own vision and character. He retired in 1938.